Happy New Year to all my blogger friends! I want to thank everyone for their comments and support of my blog. I hope to scrapbook more and create more cards in the upcoming year. My main new's resolution is to use my scrap pile of paper first before going to the cabinet and pulling out a full sheet of 8 1/2 x 11 sheet of paper. I organized my scraps this past weekend which I hope will help to make this resoultion easier to stick to. I even put the scraps by my table and left the 8 1/2 x 11 cardstock on the other half of the room, lets see if that helps (crossing fingers). My other resolution (which is going to be a lot harder) is to save for a trip to Disney in 2009. I am horrible at saving, I believe if you have it spend it! Wish me luck with this! If you have any helpful tips on how to save I would love to hear them (I"m all ears - no pun intended). What are some of your resolutions? We have no plans this evening we are suppose to get a snow storm this evening into tomorrow. I wish everyone a happy, healthy and safe New Year. Ellie's daughter Gabi is turning one January 3, Gabi and I share a birthday (my birthday is also Jan. 3 how exciting). Gabi's mom has told me that Gabi LOVES Dora so I thought a Dora birthday card would be great. I searched the internet for a Dora coloring page that I could cut and paper piece back together. 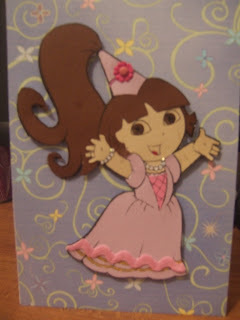 I found this princess dora and knew she was the one for the card. One a time I had I would get the piece cut out and I kept losing them, Jeff was laughing at me. I must have printed out Dora at least 10 times thats how many times I was losing her pieces. I then searched the internet to get the right colors of her outfit and things, dora's princess outfit is normally yellow (from all the pictures I saw) but I wasn't feeling the yellow so I changed her outfit to be pink and purple....plus it matches the background paper better. Her pearl necklace and bracelet has bling (stickles) even though its hard to tell in the picture. Its not perfect but I think its cute. The bottom of her dress has pink ric rack! Inside of the card reads: Happy Birthday, Gabi! Now I just got to get the card in the mail to my sweet little Gabi!! EDIT as of 12/31: My sister has bought to my attention that she is not 11 years old instead she is 12. I apologize! This is so scarey, this July she will be a teenager. AGGGHHHH! Lets not think of that, I will still think she is 11 untill she corrects me again. LOL! Regardless of what holiday it is, male cards are always hard to make. It takes me forever to come up with an idea for their type of cards. This year thanks to another Blogger Diaries of a Stamper (http://diariesofastamper.blogspot.com/) she sent me this template. This card screams male - lol! Jeff sure did get a kick out of it. 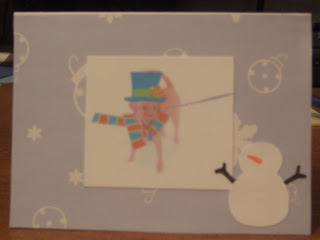 Of course I couldn't upload this before christmas because Jeff is one of my biggest blog fans (he is so wonderful, he even subscribes to my blog - I love him so much) Disclaimer: in no way does this card represent my body current body figure, instead it represents my dream body. I made these coasters for my parents for christmas. The tiles are actual flooring tiles that we purchased at home depot. 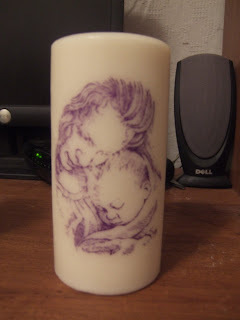 I then stamped on them with StazOn ink and colored them in with SU markers. 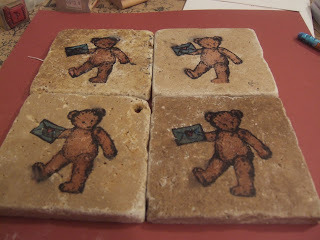 I sprayed it with an adhesive so that they are waterproof and can actually be used as coasters. I'm pleased with the way they turned out. Buddy hates two things 1. his picture taken and 2. wearing cute little holiday outfits. So throughout the year I have to take pictures of Buddy and pray that when Christmas comes I have that one perfect picture for his christmas cards that I can stamp a cute little outfit on. This year I used the hat and scarf from the SU stamp set Cold Play. It would be easier if he would wear the actual outfits instead I have to stamp the images, color them in, cut them out, print his picture, tape the stamped images to the image then copy it so it appears that the outfit is actually on him and not taped on. LOL! Anyhow I think Buddy looks cute in a top hat and scarf. LOL! Merry Christmas everyone! Thank you to my dear friend Ellie I have joined the SBS Group 7. I am so excited to join this group. I look forward to meeting new people and learning new techniques. 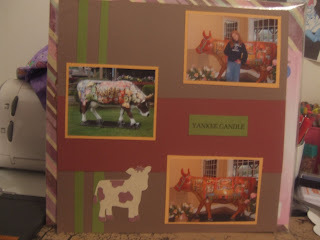 I enjoy scrapbooking, cardmaking, rubberstamping, and photography. You can never have enough pictures. My new love is my baby bug (cricut machine). 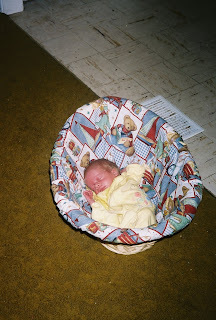 I have one son who is named Dylan and he lives in heaven, he past away at 3 months old to SIDS. We currently have no 2 legged children (hope to be blessed again one day) but we currently have a furbaby, our dog Buddy. Buddy keeps us a lot of company. Only complaint about Buddy is he isn't to fond of the camera, when the camera turns on he grunts and runs. I look forward to seeing everyone's creations and I'm delighted to be part of your group. Its snowing here in upstate NY. I called Jeff from work today to tell him I was leaving early because of the weather he said how Buddy wanted to go outside and play. I told Jeff the rules are no playing unless I am there to take pictures. I got home quickly changed and off to play we went. This year Buddy LOVES the snow. Here are my 2 favorites so far, there's lots of snow out there and still coming down which equals many more pictures. The first picture I love the look on his face. He is looking at the snow as if he's trying to figure out just what it could be. This picture shows he has figured it out and now he wants to play. 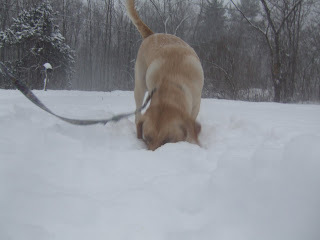 It was so cute he kept hiding his head in the snow and then would quickly jump back up with snow all over him. 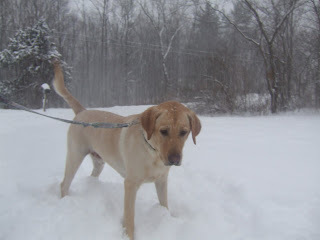 I just hope he does DON'T EAT THE YELLOW SNOW! 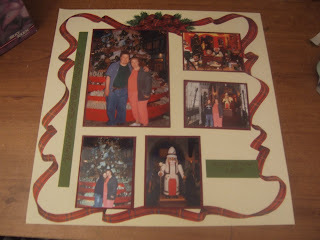 This another scrapbook page from when we visted the Yankee Candle Oulet Christmas shoppe. I love Yankee Candle Outlet! This is a simple layout. 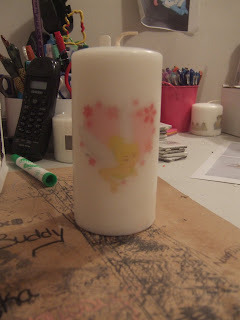 On the Split Coast Stampers website they have a tutorial on how to stamp on candles. They are so quick and easy to make. They make great christmas gifts. I am addicted to making these. 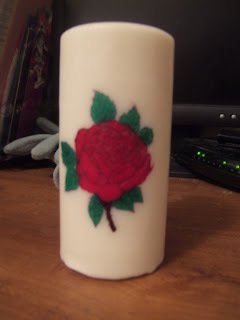 For the stitch candle (below) I took clipart of the internet and printed it onto the tissue paper. 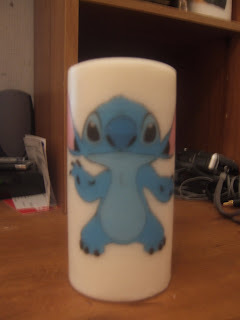 The stitch candle was suppose to be a christmas gift for Jeff but I gave it to him already I couldn't wait. He loved it! On Dec. 6, 2007 please help us remember Dylan by posting a comment below. 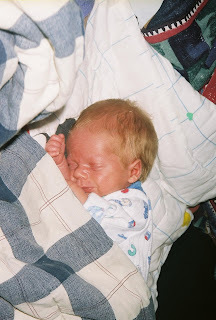 Dylan was born Oct.26, 2004 and passed away to SIDS Dec. 6,2004. It is hard to believe he passed away 3 years ago, it seems like only yesterday. For the longest time when Dec. 6 approached we would say today is then a long pause then in a quiet voice say the day Dylan passed away. Not that long ago I met Ellie (an online friend) who also lost her daughter to SIDS called it Angel Anniversary and I love the sound of that and it flows off the lips easier. Thank you Ellie! Just wanted to share a funny story about Dylan with everyone. We took Dylan to the dr. for his first checkup, now remind you Jeff and I are first time parents. I took a diaper, bottle and a blaket for Dylan. That was it, we were only going to the dr. down the road. We go in to see the dr. and he wants to weigh Dylan. Easy enough, NoT! On the cold scale he goes, that was it he peaed everywhere. The poor boy was soaked. Jeff and I were like oh no! The dr says there's nothing to worry about not a big deal just change him. I have to explain to the dr. I don't have a change of clothes with him. The dr. laughs and says let this be a lesson, you ALWAYS bring a change of clothes. After that day the diaper was like a suitcase. LOL! Please take a moment at of your busy days to hug your children/grandchildren and tell them that you love them or if they don't live with you pick up the phone and call them. 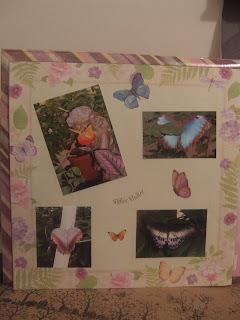 This is from when Jeff, my sister and I made a day trip to Massachuets 2 years ago to go to Magic Wings (a butterfly museum, if your ever in that area its a great place to visit the butterflies are so pretty) aftewards we did some shopping at the Yankee Candle Outlet. 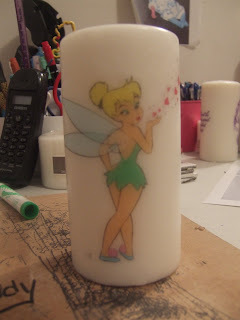 Just love their Candles. I am pleased with the way these pages turned out! 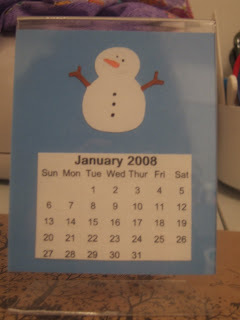 This is a desk calender that I made for a christmas for christmas. I like the way it turned out I want to keep but I guess I will be a good daughter and just make myself one. I used the cricut DoodleCharms cart, thanks to Jeff it was an early Christmas gift. For the squares I used the cricut George Cart and I had the template for the calender from a site I downloaded (if you need the site please comment below with your email address and I will send it to you). 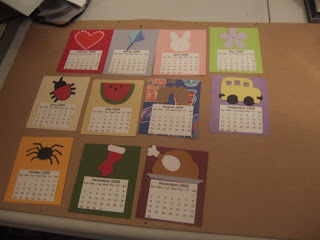 I put the calender pieces in a small aryalic (3x5) frame that you can get for $1 and change in walmart. I nice and inexpensive gift idea. For the month of February the doodlecharms cart doesn't have a kite so I used the George cart cut 2 squares and tilted the one and then cut the other in a shape of a triangle and glued them together to look like a kite and added ribbon, I think it looks like a kite.